Equipped with an efficient hybrid powertrain, the Kia Optima Hybrid is more than your typical midsize sedan. Not to mention, the 2017 Optima Hybrid offers the latest in high-quality design and advanced technology features to improve the driving experience. From the outside, you can already tell the Optima Hybrid is a one-of-a-kind vehicle. Its striking exterior combines aerodynamic shaping with eye-catching style that is sure to draw attention on the road. Every detail of the 2017 Kia Optima Hybrid is specifically engineered to provide an exceptional on-road experience. Notable exterior elements include an integrated air flap, distinctive front grille, streamlined rear bumper, and Dynamic Bending Light, which automatically adjusts the headlight beam to turn with the corner. This is only the beginning. The 2017 Kia Optima Hybrid is very well-equipped both under the hood and throughout the cabin. 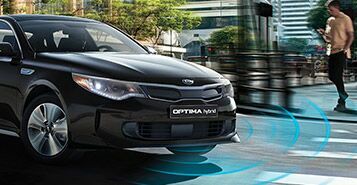 The Optima Hybrid is powered by a 2-liter Gasoline Direct Injection engine and cutting-edge full parallel hybrid system to deliver an ideal combination of power and efficiency. 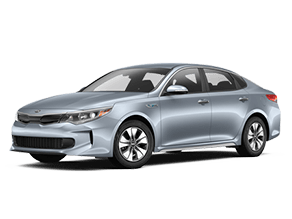 At EPA-estimated 39 mpg in the city and 46 mpg on the highway, the Kia Optima Hybrid offers an estimated range of up to 665 miles. The 2017 Optima Hybrid is equipped with a variety of high-tech driver-assist features aimed at improving safety as well as enhancing the overall driving experience. 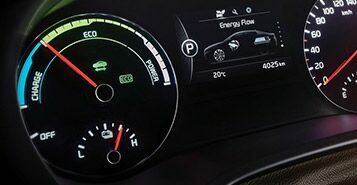 These include autonomous emergency braking, forward collision warning system, advanced smart cruise control, and UVO eServices, among others. 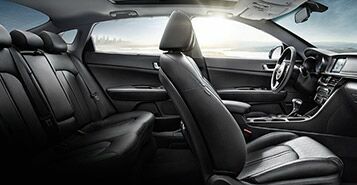 Not only is the Optima Hybrid interior comfortable for all riders, but it is designed specifically with the driver in mind. Driver-focused features include available heated and ventilated front seats, 12-way adjustable driver’s seat, push-button start, ergonomically designed center console, and much more.